Because there simply aren’t enough cherry blossom photos on Facebook, I wanted to have some of my own. 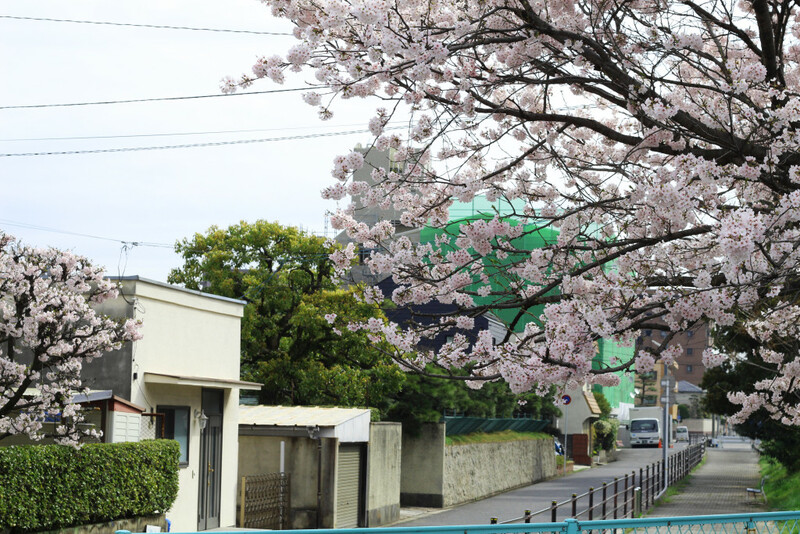 The pictures I have are more special because they’re in MY neighborhood in Japan! Time really does fly. I was just sitting at my desk in Korea, wasn’t I? Yet, just like that, I was sitting at my new desk in a new school preparing to teach English in Japan for a year. Kind of scary. I didn’t actually teach any classes today, but I needed to go in to sign lots of paperwork and do some administrative tasks…like burning CD ROMs. After lunch I headed over to the university for an orientation with new teachers throughout the organization. With the exception of myself and two new foreign teachers, they were all Japanese. I’d say maybe 30-40 in total. Because of this, everything was spoken in Japanese. Believe it or not I was able to pick up a number of words from the speaker. I guess studying on your own can actually work. The post Goodbye, Korea! appeared first on Red Dragon Diaries. Teaching ESL is a mixed bag depending on what country you target. In some countries it’s a refined, streamlined endeavor where employers seek qualified and experienced teachers and the government has mandatory guidelines as well. To obtain a work visa in a certain country, a government may actually require a teacher have a TESOL certification and/or a certain amount of experience. In other countries, this isn’t always the case. In China, it’s a little bit of both it seems. There were once days in places like Korea and Japan where anyone could roll off a plane and be offered a teaching job on their way to their hotel. Those days are over in some countries, and many others are following suit. Teaching English in South Korea has become an increasingly popular endeavor for the mainstream. More than ever before people are finding themselves attracted to the idea of traveling to Korea to teach as a way to travel, gain teaching experience, or both. Thanks to the media’s push on South Korea with regards to food, K-Pop, and travel destinations, it seems like when asked most hopeful ESL teachers will list Korea as one of their top choices. Korea has risen to become one of the top places for travelers, Seoul in particular. With a lagging job market back home in a country like America, finding a job like ESL that satisfies many interests in one bag seems to be gaining serious momentum. There are those, however, who even though they have an interest in teaching in Korea hesitate because they are unsure about the compensation packages and if it’s an endeavor that is even worth it in the end. Korea is an interesting place, and teaching here can be a lot of fun with all the things to see and do. Not to mention all the people you’ll meet – both Koreans and foreigners alike. If getting ahead is one of your goals in life, does it make sense to take the plunge to teach overseas in a country like South Korea? Every person will answer this question differently, including myself. Instead of giving you my personal opinion and the intrinsic values, I will just talk about the financial aspect of it as this seems to be the main sticking point for many. Before coming to Korea, I worked for nearly 15 years in the IT industry. I am by no means fresh out of school, and in fact I’ve seen my share of ups and downs in my life. I was working when 9/11 and the following tech bubble stock market crash happened. That hurt. I was effected greatly by the 2008 subprime mortgage crisis and subsequent economic meltdown. That really hurt. In both cases, I also know the free flow of easy money flooding the economy prior to the implosions. I know good times and bad times. I point this out so you don’t get the impression that I’m speaking in theoretical terms without any background experience or knowledge. Further, I’ve been a teacher in South Korea for over 4 years now so I feel confident that I can speak to both equations. If you are working full-time and are, at a minimum, supporting yourself you should know that bills pile up. In fact, the average person in America is buried in over $7,000 USD of credit card debt alone. This does not take into account mortgage or auto debt either. Obviously, everyone lives and operates at different income levels so disposable income varies significantly. However, we also know that most people live up to or beyond their income levels regardless of what it may be. Higher income levels generally equate to higher car payments, bigger mortgages, and more toys to pay off. With the average household debt being what it is, how much do you think people are actually saving each month? Is there even much left at the end of each month to put into savings? Let’s crossover to teaching in Korea. The way I view it is fairly simple and straight forward. There is no need to over-analyze numbers; it’s conceptual. In Korea, the average monthly income for an ESL teacher is somewhere around $2,000 – 2,200 USD. Pretty skimpy, right? If you are from the United States, your first two years of teaching are tax exempt in Korea. You also do not pay taxes in America, you just need to file a form. You receive a free apartment in nearly all cases, and you will not buy a car. No car means no monthly payment, no gas bill, no insurance bill, no oil changes, no new tires, no brake pads, and no upkeep and maintenance that can get quite costly if you are out of warranty. It’s been said before, and I’ll just reiterate; cars are a money pit. And you won’t have one in Korea. The best way to look at Korea from a financial point of view is at 30,000 feet. Each month, after taxes, pension, school lunch, and health insurance (things that are deducted automatically), you are going to receive approximately $1,500 – 2,000 in the bank. With that money you will pay for apartment utilities like cable, electric, and hot water. Over the course of a year through the four seasons this averages about $100 per month. The rest is for you. Eat, drink and be merry. Oh, and have your slick smartphone and huge data bill too if you want. How many people back home do you know personally that have $1,500+ cash in hand each month to play with? As I mentioned above I’ve seen some road and all the circus acts along the way and I can tell you that it is likely in the area of single digit percentage points. Trust me. Especially in the current job market. You probably won’t get that new M5 teaching in Korea, but you probably won’t have student loan or credit card debt hanging over your head either. Money is only part of the picture when it comes to teaching ESL overseas, but it needs to be taken into consideration. Don’t poo-poo the financial potential of ESL in Korea. To the outsider it may seem fruitless. To those who have been there and are in the know, they’re like the Chevy Chevette with a 350 crammed under the hood. A sleeper. It’s better than you might think. The post Is Teaching English in South Korea Worth It Financially? appeared first on Red Dragon Diaries.